The Chanel No. 5 The Bath, The Body, The Senses Christmas Collection 2013, consists of The Foaming Bath, 200ml ($75), The Cleansing Cream, 200ml ($75), The Bath Soap, 150g ($43, not reviewed here), The Body Lotion, 200ml ($93), The Deodorant, 100ml ($60) and The Hair Mist, 40ml ($59). The Chanel No. 5 The Bath, The Body, The Senses Christmas Collection 2013 of bath and body products is scented with Chanel’s first and most iconic No. 5 fragrance, created in 1921 by Gabrielle Chanel. Besides being named for Coco Chanel’s lucky number, this abstract scent, made up of over 80 ingredients such as ylang ylang and Grasse jasmine and May rose, harbours no specific top note. The Chanel No. 5 The Bath, The Body, The Senses Christmas Collection 2013 claims to not only scent you from top to toe, but to also moisturize, comfort and relax your body. 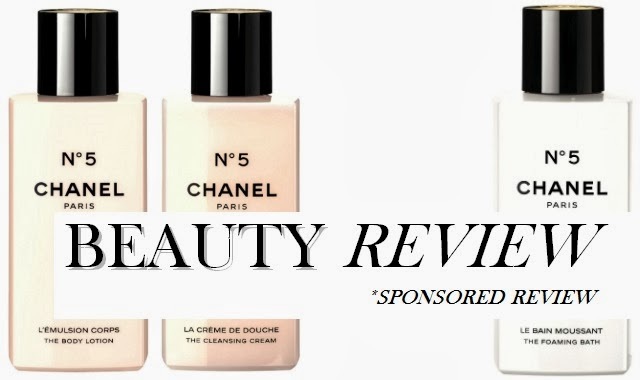 The packaging of the Chanel No. 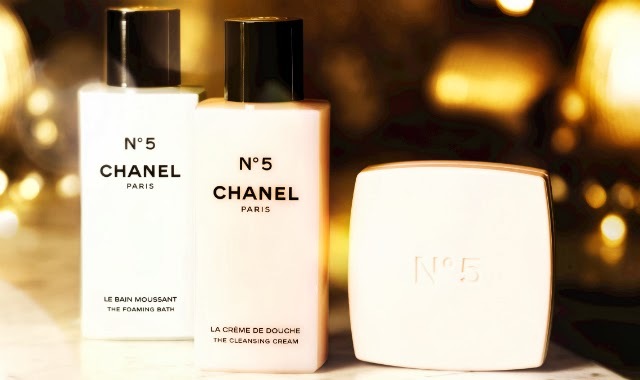 5 The Bath, The Body, The Senses Christmas Collection 2013, is classic Coco Chanel – timeless, luxurious, and on the right side of fashion-forward, even in its simple shapes, with san serif fonts and neutral white-black-gold hues. 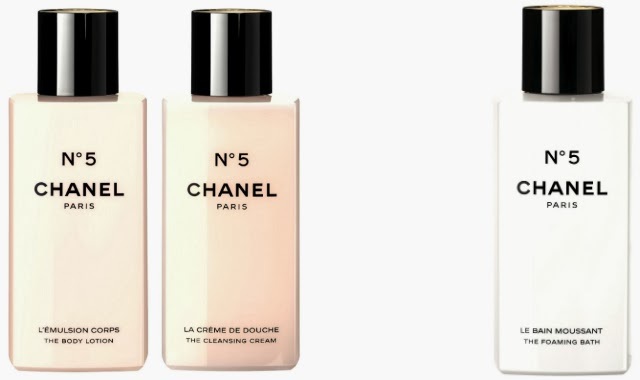 In keeping with the luxe designer positioning of this 104-year-old French brand, The Foaming Bath, The Cleansing Cream and The Body Lotion have screw caps in heavy acrylic – a bit unwieldy in the shower stall but hey, luxury doesn’t come cheap. The Deodorant comes in a lightweight canister, very post-modern, and slim-enough for any gym bag. So too The Hair Mist, which is even niftier at just 40ml. The Chanel No. 5 Cleansing Cream foams lightly – two 20-cent-coin-size squirts are enough for the entire body – and rinses off easily, leaving the skin silken and scented. The Chanel No. 5 Foam Bath is great for soaking hands and feet pre manicure and pedicure. This also rinses off easily and leaves a subtle just-right bouquet. I’m not a fan of body lotions as I find most hard to rub in and to have overpowering scents. The Chanel No. 5 Body Lotion however is light yet creamy and absorbed into my skin in double-quick time, leaving me feeling pampered and perfumed. The Chanel No. 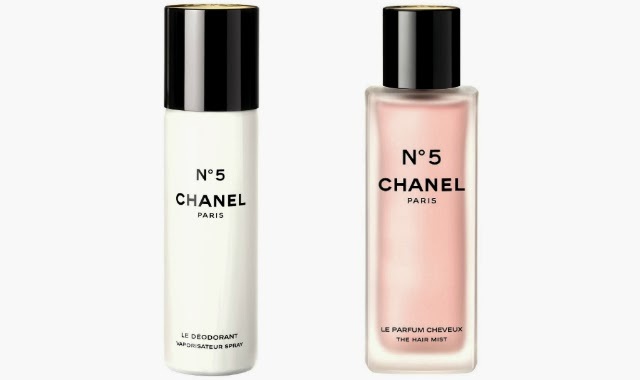 5 Deodorant works like a fragrance for active days and the Chanel No. 5 Hair Mist is addictive and more-ish – hair smells so lovely after each spritz you just want to keep adding more. I applied a halo of it onto my tresses before bedtime and I swear it helped put me to slumber – relaxing indeed. I loved how I smelt the next morning – like a million bucks. When layered over one another, the Chanel No. 5 The Bath, The Body, The Senses Christmas Collection 2013 bath and body products have a light yet lasting fragrance power. They’re great essentials to have in the shower, prettify the bathroom, and aren’t too heavy to cart with you on a relaxing vacation. Such luxury is worth every dollar, and with Christmas around the corner, it is just the thing to pamper yourself with. One does feel and smell like fashion royalty after each layering session. All that’s missing from this collection is a purse-size hand cream. I’m sure Marilyn would agree. The Chanel No. 5 The Bath, The Body, The Senses Christmas Collection 2013 is available from the Chanel Fragrance and Beauty Boutiques located at selected Chanel Beauty counters. For more information about Chanel, go to www.chanel.com. Follow Chanel on Facebook at www.facebook.com/chanel; on Twitter at @CHANEL and on YouTube at www.youtube.com/user/CHANEL.